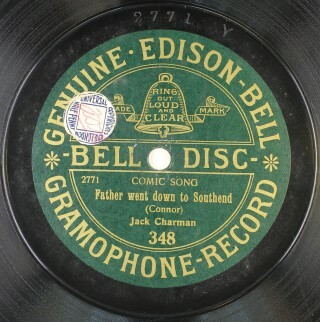 This song is taken from a 78rpm Edison Bell gramophone disc released in 1911 or 1912 (Acc. SA710 part). It was written by T.W. Connor, who wrote a number of other music hall favourites such as ‘She Was One of the Early Birds (And I Was One of the Worms)’, ‘I’m the Airy Fairy’ and ‘A Little Bit of Cucumber’. This last can be heard performed by Mr Cutmore of Halstead on the Essex Record Office CD How to Speak Essex: 20th century voices from the Essex Sound and Video Archive. ‘Father Went Down to Southend’ provides evidence of the popularity of the resort as a destination for day trippers travelling by rail from London in the late nineteenth and early twentieth centuries, telling a story – which may be familiar to some of us even now – of a man who ‘didn’t see much of the water, but he put some beers away’! The tune is lively and the words humorous. 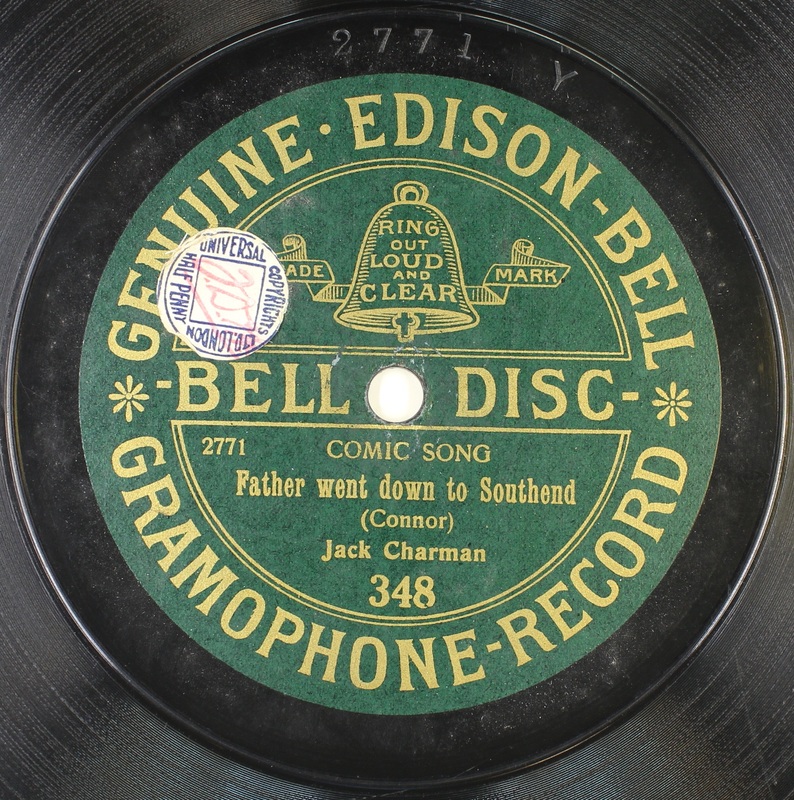 If the recording quality sounds a little less than ‘hi-fidelity’ to our modern ears, it is worth noting that the disc itself is over 100 years old and that it would have been recorded acoustically – that is, without microphones – requiring the singer and accompanying orchestra to be arranged in front of a conical horn (somewhat akin to those seen on gramophones) and to perform live. The full song can be heard on our Soundcloud channel.